Lake Lyndon. Lack of rain has seen the lake level drop significantly. Pic taken mid-2016. Photograph Allan Burgess. I would like to tell you about the joys of fishing small high country lakes and tarns. The South Island is blessed with many of these gems. For the most part, they are usually passed by for more popular spots. When the high country season rolls around large numbers of anglers flock to Lake Coleridge and to a lesser extent Lake Pearson, I also count myself in this brigade. This year upon hearing that Lake Coleridge was fairly high, I decided to try somewhere different. With limited time to fish, and also wanting to take my family along had too, I had to find a spot to suit us al. Lake Pearson was our choice as I wanted to fly fish. Upon our arrival, many anglers were about the lake. A moderate nor wester was blowing but it was not over strong as calm spots could be seen around the lake. The eastern end was choppy so it was to the top end that we went. The sun was out and it was warm. These were ideal conditions so early in the season. From past experiences l tied on a size 8 dragonﬂy nymph and stalked the shoreline. A few fish were cruising the shallows with the odd fish rising. So after a nice brownie came along on his beat and went past I made a cast 5 metres ahead of him. He drifted across and took the nymph. It was a ﬁsh of about 3 lbs. A good start for the day. Walking back to the car for lunch I saw a nice ﬁsh of about 6 lbs. As I made a cast a gust of wind disturbed the water and I lost sight of him. Over the morning and early afternoon, I saw many nice fish and wouldn’t have walked more than two hundred meters from the car. On the way home, we stopped at Lake Lyndon and I rose a small rainbow in the shallows to a dry ﬂy and saw plenty more. These small lakes warm up a lot quicker than the larger ones and are more receptive to fly fishing. The best fly to fish depends on the time of year. Dragonfly nymph stage early in the season, followed by green beetles and Loves Lures, midges are also prolific. On windy days a snail pattern washing around in the waves can induce some savage strikes from rainbows. l managed to get a day off work that coincided with a day of weather that you only dream of. A mate and I left Christchurch about 8:30 am. We arrived in the high country to find Lake Georgina calm. As we slowed to see if we could see anything cruising a ﬁsh rose right by the road. Onward we went. 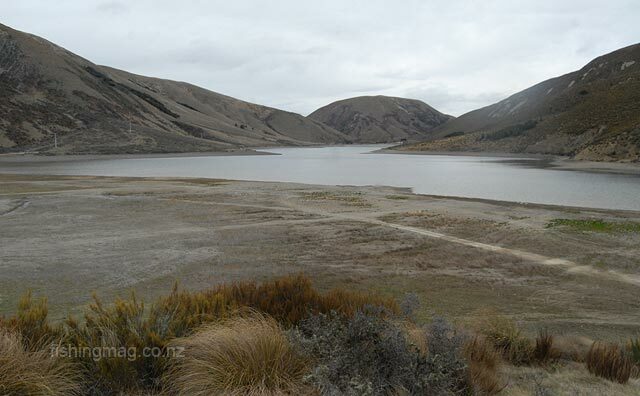 We took a look at Lake Coleridge. It also was like glass. We crossed the Ryton River and on to our destination. Over the hill and we were at Lake Selfe. An emerald gem to behold. We took a slow ride to the top end to see if any fish could be seen. We stopped the car and got out. Fish were rising everywhere! One jumped clean out of the water on the far side and something glistened in the sunlight. The ﬁsh was connected to a cast and on closer inspection, an angler on the far side was to beach him. We were here now so might as well give it a go as we could still fish our original destination later on. We stalked the shallows and cast. We changed flies and had fish come up and look but everyone turned their noses up at our offerings. Some pretty nice fish were about that morning but they had us beat. They were rising, they were also taking nymphs but not ours, so at midday, we were off to our original spot. By this time it was about 28C with little wind. A drink and a change of tact were needed so I tied on a humpy blowfly and within minutes I was battling a ten-inch rainbow and after landing he went back. A few casts later and another scrappy rainbow went back to join his mates. While walking around the shoreline we spotted many browns cruising and they must have taken lessons from their mates in Lake Selfe. I walked to the top end of the lake and after spotting a nice ﬁsh cruising the edge of the weed bed I had just made a cast when back on his beat he came but my ﬂy was too far out so a quick pull and it was in line with him. It sank so I left it there and as quick as a flash the fish left the bottom and took the fly just under the surface and took off headed to the middle of the lake. Soon he was landed and also released, a rainbow of 3 1/2 lbs. I saw more fish cruising but was also in dire need of a drink so it was back to the car. A cool can of beer and a litre of juice restored some life as it had been four and a half hours since we had left the car. Into the early evening, we took a look on the other side of the lake. I soon spotted a nice brownie and made cast just a meter in front. He took it, and like the earlier fish made straight for the middle of the lake. A good fight followed. After time to revive he swam off, a good 4 lbs and in top condition. While looking for more fish in and around the scrub l put a cast a couple of rod lengths out so l wouldn’t get it caught up in the scrub. I was looking the other way when a bloop made us look at my fly with a fish attached heading to the bottom. A quick lift of the rod and fish number five came to the bank. He also rejoined his friends. Some of these small lakes are very fragile and while I might have been justified in taking a fish l would rather take a fish from somewhere I know could sustain one less fish. Quietly stalking small lakes is very relaxing fishing. I find them very challenging. We have lakes in Canterbury that l haven’t caught fish from and have these on this year’s agenda. What l look for is shallows moving into deep water. The fish cruise these shallows and move into the deep only to return minutes later. Browns seem only to move a short distance on small lakes. They were moving only twenty or thirty meters before turning. On the return beat, a lighter cast and smaller flies are needed. For these calm days try a size 16 fly with a 2 or 3 lb tippet and no movement from you. The line colour wasn’t a problem but quick movement from us was. One thing that I found interesting this season was the browns that wouldn’t take during the day wanted the same fly later in the evening. Say from about 5 pm onwards. Whereas they had turned their noses up all day. The secret for dry fly fishing is in the sun shining. You must have it for two reasons. Firstly, for easy spotting and the second is for insect hatches. Many a time l have had fish rising suddenly go off because of the sun going behind a large cloud for a while and come straight back on when it reappears. 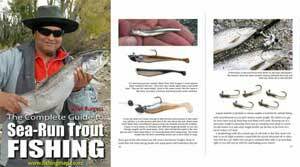 Light tackle is the go for these lakes as casting is short and accurate. I use my 9′ 4pce Scott 6wt medium action as fish caught close tend to jump. The brownie I caught did just that several times in close. So pick a small high country lake or tarn you like and haven’t fished and make a point of giving it a go!